The Trump administration will be great for telecom companies. And terrible for internet users. FCC Commissioner Ajit Pai testifies before the Senate Judiciary Committee’s Privacy, Technology and the Law Subcommittee hearing on May 11. A rule of thumb I follow is to never be surprised when a politician who vows to do bad things keeps his or her word. So as the Trump administration unfolds, it comes as no shock that Big Telecom is about to get pretty much everything it wants over the next four to eight years—and that the open internet, open technology in general, consumer welfare, and maybe even free speech are in serious jeopardy. Trump’s appointees might make it easier for him to clamp down on speech. 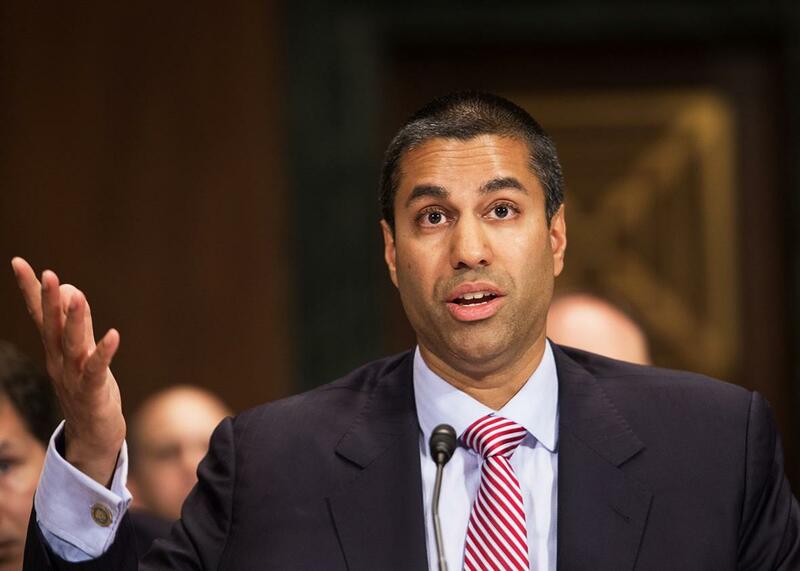 That’s why we should worry about the appointment of Ajit Pai, a former Verizon lawyer and Republican cheerleader for the telecom industry, to head the Federal Communications Commission. Pai, a minority-party commissioner the past few years, had opposed pretty much every key policy moved forward by Tom Wheeler, his Obama-era predecessor. Furthermore, Wheeler says that Pai repeatedly canceled one-on-one conversations with the then-chairman. Now it’s his chance, and he’s wasted no time. Under Pai, expect the commission to dismantle Wheeler-led rules for network neutrality of internet traffic: the notion that consumers, not the telecoms, should decide what priority to give specific kinds of data. The net neutrality provisions came about after the FCC reclassified internet providers as “common carriers,” and Pai—who claims to favor a free and open internet—was a bitter opponent all the way. Republicans’ supposed belief in competition doesn’t extend, in many states controlled by Republicans, to letting municipalities step in where corporate ISPs have refused to provide or sufficiently upgrade bandwidth. In about two-fifths of the states, laws prevent underserved communities from creating their own high-speed networks or otherwise stifle competition. Over at the Federal Trade Commission, things aren’t likely to be much better. Under Obama, the FTC began to take seriously the catastrophic state of device security—manufacturers and carriers are much, much more interested in selling new gear and service than helping customers secure the equipment they’ve already bought. In a heartening move in January, the FTC sued one manufacturer, D-Link, for its alleged “failure to take reasonable steps to secure the routers and Internet-protocol cameras they designed for, marketed, and sold to United States consumers.” The company said it would fight the accusations. But I will be shocked if we see any other such actions in the coming years even though device insecurity is a disaster waiting to happen, in part because it gives bad actors (including the new government) lots of easy ways to spy on people. Is there any hope? Maybe. The end of net neutrality could be very bad for business on Main Street. Suppose you run a store in your neighborhood, and Comcast says it if you don’t pay more, it’ll slow traffic to your store’s website. Carriers insist they’d never, ever do such things, but it may well be in their financial interest to do them. If owners of small and medium-size businesses realize this, they can fight it—and it’s better to prevent malign ISP behavior now than challenge it later. Some help could come from another front, too. In the 1980s, facing a Reagan administration that actively undermined antitrust enforcement at the federal level, state governments took up the slack. A number of state attorneys general, and not just Democrats, became pro-consumer and pro-competition activists. Those efforts continued into the 1990s and early 2000s. Yes, the vast majority of state governments are now controlled by Republicans who are unlikely to offer much support for pro-consumer laws and regulations. But the job of state attorney general is a common stepping-stone to a governor’s office, and protecting consumers has appeal beyond Democratic voters. Republicans in the past didn’t normally relish angering consumers, and maybe some of the current crop—typically much more extreme in right-wing views, however—will feel the same way. Moreover, governments in several of the largest states, notably California and New York, are still controlled by Democrats. New York state just sued Charter Communications, which has an effective monopoly in New York City, for allegedly failing to provide promised internet speeds. This is useful first step, and New York’s attorney general, Eric Schneiderman, is looking more and more like he relishes an activist role. Meanwhile, California’s new attorney general, former congressman Xavier Becerra, is an unknown quantity in his current job. But his résumé is impressive, which should give us some hope. Perhaps his constituents (I’m one) will push him to take on consumer protection as a core mission. If states do step up to consumer protection, however, you can expect Trump and the Republican Congress to step in—to slow or stop such behavior. Just as GOP legislators are slamming municipalities’ rights on high-speed Internet service, Congress may well forbid states from tough consumer protection. Under the best of circumstances, we’re in for some challenging times. Under the worst, things will be beyond grim.